Erosion continues to be a big concern for residents living in the Loma Fire burn area of the Santa Cruz Mountains. 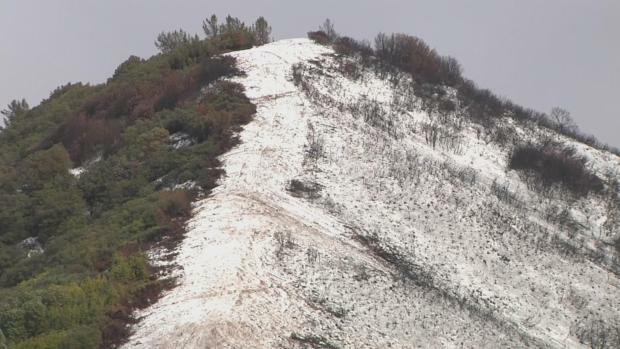 Monday's scene showed the area covered in a light dusting of snow. One homeowner told NBC Bay Area the scorched terrain is holding up surprisingly well from the storms. Still residents and business owners have had just about enough of the stormy weather. Hector Leija of Los Gatos, for one, has had it with the rain. He manages the Summit Store along Summit Road in the Santa Cruz Mountains, and he said Mother Nature has taken a toll on his bottom line. . Erosion continues to be a big concerns for residents living in the Loma Fire burn area of the Santa Cruz Mountains. Robert Handa reports. "I'm ready for a break," he said. "I believe we've been slower just because I think most people are hunkered down, coming in for just the normal wood, water, soup, that kind of thing." Patti Creech, who was visiting her son nearby, said she's concerned about downed trees. "The only thing I worried about driving up this today was a tree falling on me because this place just has so many trees," she said. People showed up on Monday to look at what was left of Nelson Road in Scotts Valley, which collapsed on Sunday. "It's shocking," Scotts Valley-resident Peter Gross said. "I've been here for many winters in the past and this is the first one this severe that I can remember in a while." Clara Zahorsky of Santa Cruz added, "It's the earth. It takes us out sometimes. Nothing we can do but try to just be prepared, and I think everyone needs to stay defensive with their driving." Despite the hazards, some welcome the rain. "I think that it's actually really positive because I think California needs rain right now," said Jamie Thompson of Santa Cruz. "It's challenging in the short term, but really it's thirsty so I think it's great."